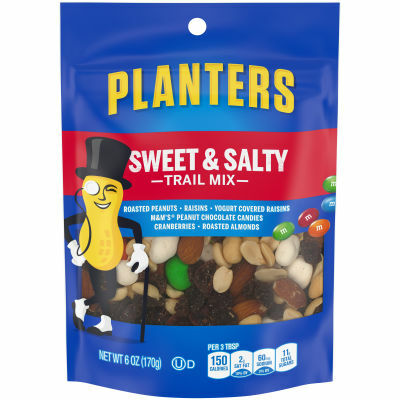 This trail mix contains portions of six different dried fruits and nuts that provide a delicious combination of salty and sweet. Soft and chewy raisins, cranberries and yogurt coated raisins are combined with crunchy roasted peanuts, roasted almonds and M&M's Peanut chocolate candies to create a heavenly experience in your mouth. Available in a 6 oz. bag, this sweet and salty trail mix is always fresh and kosher friendly. This fruit and nut mixtures provides a wholesome daily snack you can feel good about eating.